This is a picture from the first CookieCon in 2012. I was about to teach a roomful of cookiers how I painted on cookies… and I felt a little like throwing up. It might sound cheesy, but that experience ended up being one of the most rewarding of my life, complete with spontaneous standing ovation from the crowd and a lot of that crowd in tears, the good kind! I don’t consider myself superstitious, but I have worn this dress to every CookieCon since… with the same shoes… and glasses! and fake bangs… wait, WHAT?! more on those later. the red 2012 dress/coat combo and shoes, still going strong at this year’s CookieCon (far right). Which brings me to the purpose of this post. I get asked about my clothes a lot. Do I sew my outfits? Where do I find my clothes? Do I ever wear jeans and a t-shirt? so I thought I would answer those questions. First off, I WISH I had the talent of sewing! I pretend to sew every once in a while and it turns out ok, but it’s usually a banner or a pillow or other super simple, non-scary thing that I won’t sew my fingers together over. Second, I find lots of my clothes from thrift stores and etsy. So I thought I’d give credit where it is due and share all the details on my CookieCon fashion this year. 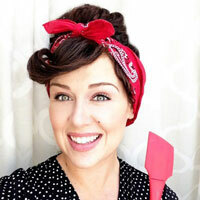 I have a couple of aprons from Tracie of Mama & Madison and let me just say they are brilliant! I love to teach in them because I can wear a simple dress or comfy leggings and the apron does all the work of dressing it up. It is like a chef’s coat but with femininity and character. She makes them in the cutest fabrics and they are such great quality! This girl can sew! and every detail is perfect. I wore this adorable retro baking apron during my Pre-CookieCon classes. Comfy and cute? this apron is both and I love it! This scarf is hilarious and cute, again win/win! I wore this the first evening out in Salt Lake City because it was colder than I expected. What was all that cold, white stuff?! I found this awesome baking themed scarf in a boutique while roaming Morro Bay. Good news is you don’t have to drive to Morro Bay to get one as they are available online,(but that’s a great excuse to go to Morro Bay because it is beautiful and we could meet for fish and chips and buy scarves). You can find this one from “Primitives by Kathy” and there are lots of different themes that would make great gifts for that special gardener or dog lover in your life. They are large and have small tassels running down the short sides. The illustrations are charming and hilarious and don’t get me started on the color, not to mention it’s a great price and I’m a total bargain hunter. The day after my two Pre-CookieCon classes I decided to throw a party, and not just any party. It was a sock hop to thank my McGoo U subscribers, complete with poodle skirts and a soda stand with special flavors like an “Arty” (mint julep), “Mr. John” (chocolate Pepsi, “Kim” (dirty Diet Coke), and a “CC17” (cookie dough flavored milk). I had a vision of wearing a poodle skirt, but instead of the leashed dog, I wanted a mixer with a cord. I had barely vocalized my dream skirt idea to my sister Andrea when the next thing I knew she texted me and told me it was finished… wha? how? She had made my dream come true and even sewed me a coordinating scarf. Can you handle the cuteness?! Andrea is an amazing seamstress who creates incredible costumes for her local high school’s drama productions and sews adorable aprons as well for a local boutique. She needs an etsy shop STAT because look at this makeup bag and brush roll that I take on every trip! This dream skirt called for dream shoes and I got to work on a pair of heels I got from a thrift store. I played around with some gesso, a dollar store car sponge, Mod Podge Collage Clay, some paint, fake cherries, acrylic paint, and some rice and ended up with these babies. The finishing touch for an outfit this epic could only be a Wilma Flinstone-esque thrifted necklace. The sock hop was fabulous and we had a very special guest serenade us. At the sock hop: Arty, Elvis, and Kim who decorated her shoes too! I found this sweet dress on etsy. The looped detail on the neckline and sleeves reminded me of piped royal icing and the color was just dreamy! Do yourself a favor; go to etsy and do a search for vintage 1950’s. Whether you buy anything or not, it is so fun to time travel by looking at real 1950’s fashion! I lose track of time swooning over the cut and colors of dresses and coats. Buy all the vintage dresses you fall in love with, but don’t snag any from me! I had to choose which ones made the cut for CookieCon and it was tough. I wore this one on Friday, paired with these mint shoes I had kicking around from another favorite online shop ModCloth (which are not available anymore). The last day of the conference I taught a breakout session on “Flexing Your Creative Muscles”. This class was a lot more casual than being a presenter, but the occasion still called for my “go to” red ruffled dress I’ve been wearing since the first CookieCon. This combination was also an etsy find and as soon as I saw the white dress with the ruffles (and that collar!) and the perfectly coordinated coat (look at those sleeves!) I knew it was meant for me. Vintage sizing can be misleading so really pay attention to the measurements the sellers give of each garment. Paired with a pair of Payless shoes (I was told I’m not supposed to let people know that) and a pair of glasses that I don’t need… oh and a pair of clip-on bangs that I trimmed Bettie Page style (I’m probably not supposed to reveal that either) and my look is complete. I know… breathe. Clip-on bangs. Here’s the deal: I would cut real bangs, but they wouldn’t look like that. I have curly hair and bangs are no bueno on me. I know because I’ve made that mistake several times. Also, it looks like I have bangs sometimes, but they are faked, not to be mistaken for fake bangs. Huh?! “Faked bangs” are when I roll my own hair into bangs or sweep my hair to the side to create a bang look. The only fake bangs are in the picture with the red outfit. So yeah. Fake bangs. The chestnut is practically a perfect match for me. What color would you get? You know you wanna! My mom made this dress for me for the 2014 CookieCon when I was the keynote speaker. The fabric is the cutest and she made a matching bowtie for Mr. John of course! My mom used to sew most of my clothes as a kid, so the whole picking out fabric, measuring, getting poked by pins process reminded me of my childhood. The big difference is that I appreciate it a whole heckuva lot more now. Thank you mom! I wore this to the banquet on the final night of the conference. Yes, yes I do! I love jeans and t-shirts. I especially love this awesome Sweet Sugarbelle t shirt my friend Callye gave me that I wore as we headed out of Salt Lake City, leaving Cookie Town behind. I’m actually wearing it right now as I type this. It’s so soft. I also have been loving my new tote bag that I got from Studios on the Park, the coolest art studio where I have begun teaching local cookie decorating classes. There were several prints there by an artist that were so fabulous and then I saw her bags made out of fabric with her art on it and I fell in love. The artist Kelly Gilleran digitizes her original artwork, makes it into fabric and then sews it into these awesome totes. If I was lame I would say, “Totes adorbs!” But I’m not lame so I won’t, but how rad is that?! I can’t tell you how many compliments I have gotten on this bag in the few short weeks that I’ve had it. Just for having great taste! It’s the perfect size and is super sturdy. It was hard to choose! OY! I know that was a lot of ME, and I promise to post about CookieCon “The Adventure”, but I really wanted to dispel the myth that I have any skills with a sewing machine and introduce you to some awesome people who DO posses those ninja needle skills and some fun places I go to find fun styles. Disclaimer: I don’t pretend to know anything about fashion. I just know what I like.